GN solids control have VFD decanter centrifuge for sale. Welcome to inquiry us for drilling fluids decanter centrifuge GLW-V-355x1250N . GN decanter centrifuge mainly used for drilling fluids processing, barite recovery, drilling waste treatment, mud weighted, etc projects. We also produce related equipments fitted for the centrifuge, to be assembly as a complete drilling mud processing system, including mud tank, mud agitator, mud mixer, shale shaker, etc. The device protects the Compensating gear from torque overload, which is installed in the outside end of the Compensating gear. The torque of gear is limited with a spring clutch by which power can be imputed. While overload cuts off spring clutch with driving shaft, the face of spring move the gland down to outside for 6mm and the stroke faucet switch on to switch off the power of main motor and fluid supply pump. 1) Firstly start the auxiliary motor. 2) After thirty second, the main motor allows to be started. 1) Firstly stop the main motor. 2) After ten minutes, the electric interlock device will automatically switch the power of the auxiliary motor. With the electric interlock device, the correct program can be automatically carried out and unexpected result from wrong operation can be avoided. Quickly show system. The digital rotary speed of centrifuge can be controlled accurately and shown on LCD screen. 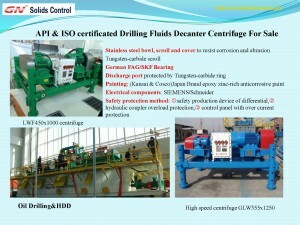 For more information about GN VFD decanter centrifuge, pls contact us freely. hi,am interested in your centrifuge decanter,solid control,how much is the price.